Starbucks now has these Mini Starbucks Cards. So cute! 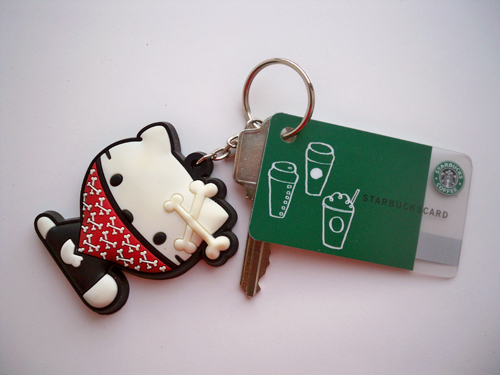 Love the Hello Kitty Key Ring. Where did you find it? Nevermind the card, tell us about the keychain! I saw the mini-cards today too! I was so excited; my boyfriend, however, was a party pooper and didn't care. Did they send you it in the mail? I got mine in the mail about a month ago and it already had $5 loaded on it. So cute mini-card and a free latte! Whoohoo! I just saw those mini cards in Boston last weekend! I had a feeling that they were "new"! I also saw those keyrings in Forever21 not too long ago! LOVE HELLO KITTY! Shruti got me the Hello Kitty keychain! I have heard some folks say they have them at Hot Topic.